OS grid reference: SD 8700 3780. St John’s Church And Church-yard, Great Marsden, stands about ½ a mile to the north of Nelson town centre – up Barkerhouse road. Today, the modern church which is dedicated to St. John the Evangelist, has been amalgamated with that of the old St. Philip’s church on Leeds road, Nelson, and is much in use as a church centre for many local functions and social gatherings. The churchyard has many splendid old Victorian tombs and monuments, some quite tall and ornate ones, recalling the names of the many eminent local people that are of great interest to the area; and there are also many newer graves as well as a collection of interesting graveslabs from the 1st and 2nd world wars. View inside St John’s churchtard. 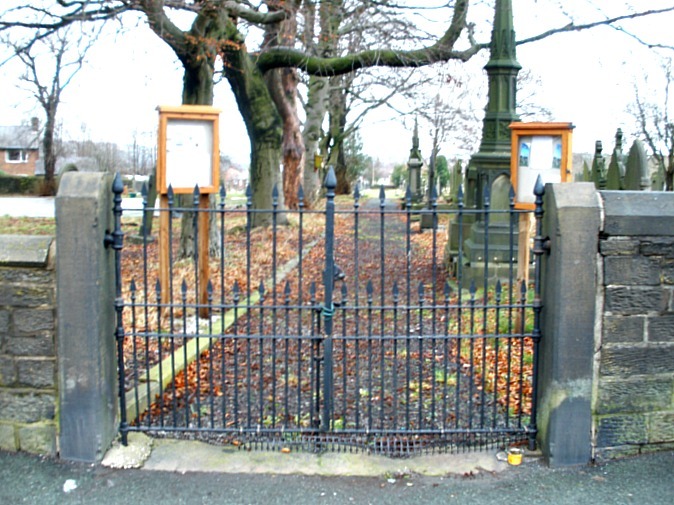 In 1846 a Mrs Maw and a Miss Walton heirs to the Marsden Hall Estate gave land and money for the establishment of a church and burial ground at Great Marsden, adjoining Barkerhouse Road. The church was finished and consecrated in 1848. It was built in the ‘standard’ Victorian-Gothic style with nave, side and middle aisles; the stone used in it’s construction apparently coming from the local quarries at nearby Catlow. 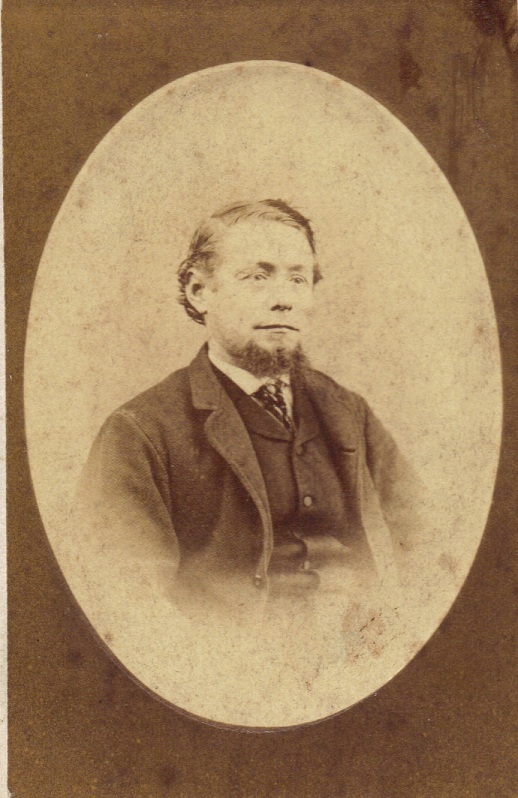 William Messenger was first vicar. The church was restored and extended in 1896 but problems with dry rot meant it had to be demolished in 1995. A new church was consecrated in 2000, but the graveyard had by then become much neglected. The site covers 6.5 acres, and some 17,000 burials have taken place over the past century and a half. In 1848 the Town of Nelson did not exist. The area included two townships or villages – Great and Little Marsden. Little Marsden had it’s own church but most people in Great Marsden attended and were buried at St Bartholomew’s in Colne. The Townships only became Nelson after the East Lancashire Railway Company named it’s new station ‘Nelson’ after the Nelson Inn, which stood nearby. The Nelson Inn had been built in 1805 by my ancestors and given the name after the victory and death of Admiral Lord Nelson at Trafalgar that same year. The population of the area had grown rapidly throughout the 19th century as handloom weaving in peoples’ houses was replaced by power loom weaving in local factories – the economics of scale allowing more cloth to be produced more rapidly to meet a growing demand for cotton garments and bedding. By the 1840’s there was clearly a need to have a new church in Great Marsden itself, and a mission was established to facilitate this. 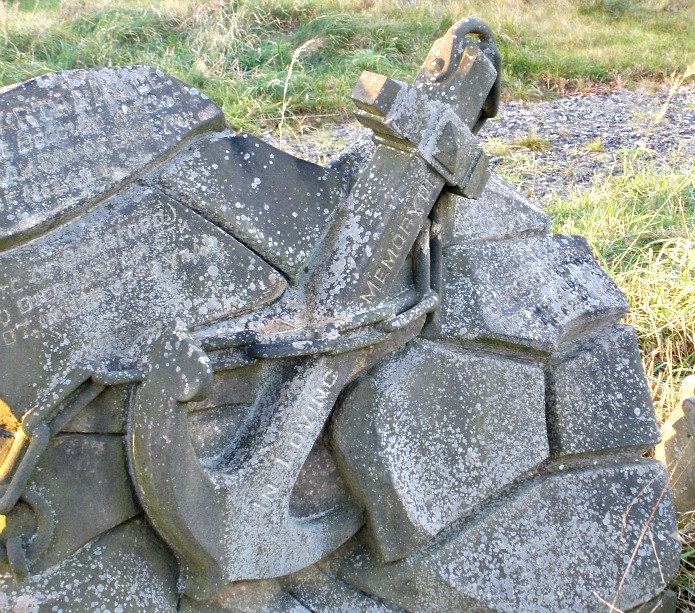 Anchor on grave, St John’s churchyard. In 1895 a new municipal burial site was established on Walton Lane as part of the new borough’s plans to emulate other boroughs with big projects like municipal buildings and parks high on the agendas of those who sought public office. Although people continued to be buried at St John’s the numbers declined in the 20th century, descendants themselves began to die off and the original occupants forgotten. The second half of the 20th century was a period of neglect. 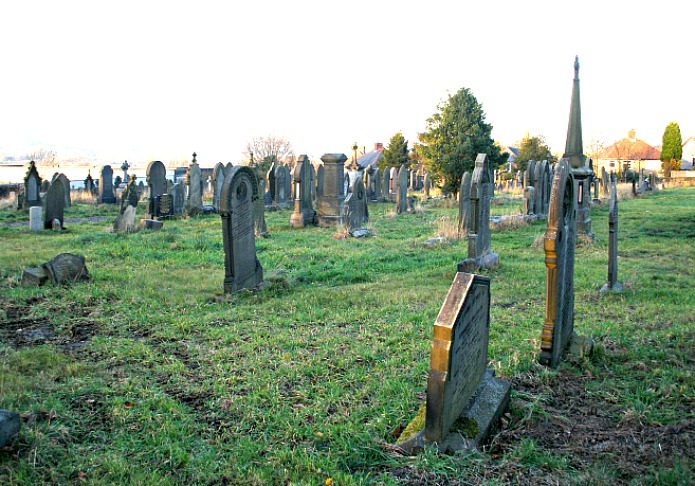 The burial ground was also affected by vandalism, subsidence and the encroachment of Japanese Knotweed, so that parts of the burial ground became inaccessible. My mother recalls successive vicars trying “desperately” to battle nature’s encroachment with little more than hedge trimmers and a garden lawn-mower! 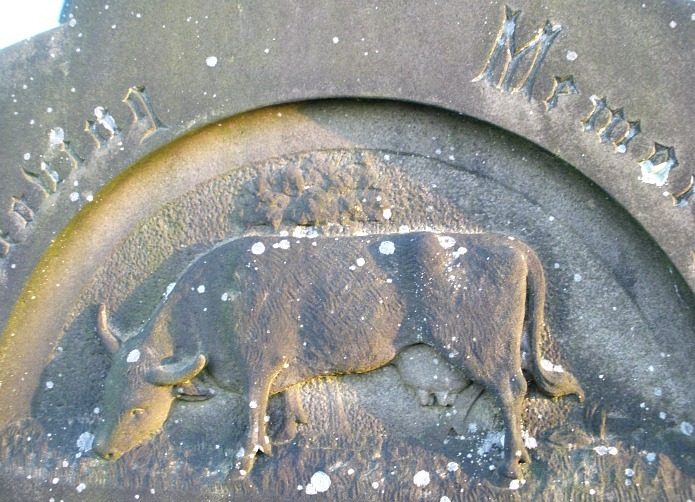 Cow on gravestone at St John’s churchyard. In 2005 a group of concerned individuals many of whom had ancestors buried in the graveyard came together to establish a new group ‘The Friends of St Johns Churchyard’ and to establish a project to restore the churchyard and to make it accessible again. Over the past 8 years the churchyard has been transformed, the Japanese Knotweed eradicated, the subsidence dealt with, vandalism stopped and the grass regularly mown, seating established and, finally a memorial garden for quiet contemplation, set up. The many “often” spectacular monuments which can now be viewed – can be seen to reflect the new wealth of the area in the late 19th and 20th centuries with the more humble monuments often reflecting the interests, beliefs, and lives of the people buried there, with for example nautical (see photo above, left) and agricultural (see photo, right) carvings on some tombstones, and doves of peace etc on others. 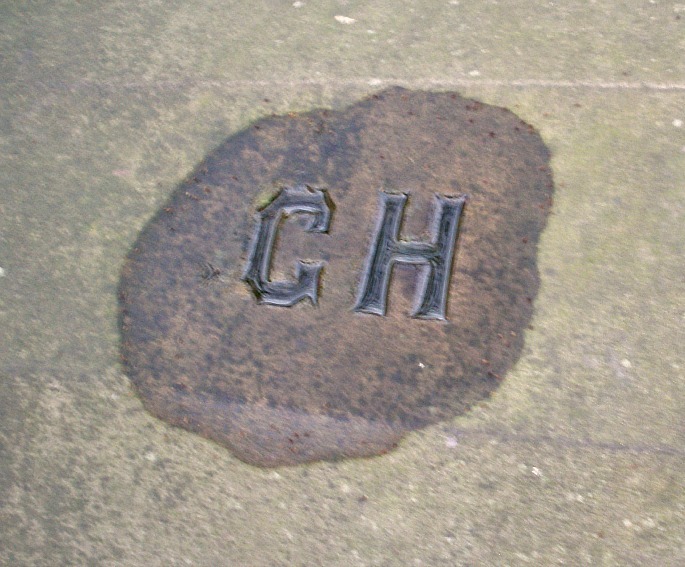 ‘GH’ on grave, St John’s churchyard. One of the more humble graves is that of my Great-Great-Grandfather, George Hillary 1837-69 (see photo below, right). The grave is marked with a simple inscription the letters ‘GH’ perhaps reflecting his view that there should be a lack of fuss over his funeral or that the family thought he would always be remembered by the local townsfolk. George was something of a local personality. People called him ‘George the Dandy’ on account of his liking for the most up-to-date fashions and his collection of waistcoats, a popular garment at the time with even children wearing them. As a youth George had travelled to the West Indies to work for a sugar company based in Liverpool, then as an adult he had worked for his father in law who had inherited the Nelson Inn as book-keeper and, later to learn the trade of Licensed Victualler. It was clear Matthew Manley had wanted him to take over on his retirement but fate was to intervene. George died aged 31 or perhaps 32 just one year before Matthew, of Tuberculosis, then called ‘consumption’ because of the way it appears to consume the body with feverish symptoms. It is said half the townsfolk turned out for the funeral. George’s prediction that the undertakers would fail to turn up came true when they got the date wrong! and men had to be found to carry the coffin from the Nelson Inn to the churchyard up the hill in Barkerhouse Road. Also buried here are George’s wife, her second husband, George’s mother, and her parents, George’s brother and sister, his sister in law and brother in law, grandson and many cousins, too numerous to mention here. By 2014 there has been a further renewal of interest in the graveyard, and for people seeking information about their ancestors as part of the ‘trend’ in Family History. The Friends now have requests for information from across the World. Some years ago the Pendle and Burnley Branch of ‘The Lancashire Family History and Heraldry Society’ recorded the information from ‘The Grave Books and Memorial Inscriptions’ and this is now available on CD (Details on The Friends of St John’s Churchyard Website). Lancashire Family History and Heraldry Society: ‘Great Marsden (Nelson), St John the Evangelist Memorial Inscriptions and Grave Books’ CD. Wilson, G.V., ‘Tales of the Nelson Inn’, Nelson and Colne Historical Society, 1966. Bennett, W., ‘The History of Marsden and Nelson’, Nelson Corporation, 1957. Categories: Misc Subjects | Tags: St John the Evangelist church Great Marsden in Nelson Lancashire, St John's Church and Churchyard at Great Marsden in Nelson Lancashire | Permalink.